»Did You Know That Scenes From The Dirty Picture Was Shot At Bidar Fort? Did You Know That Scenes From The Dirty Picture Was Shot At Bidar Fort? Bidar district forms the crown of the state of Karnataka since it is the topmost city situated in the North-eastern tip. The name Bidar is derived from the Kannada word "bidiru" which translates to bamboo since the city was earlier known for its bamboo clusters. Bidar is known as "The City Of Whispering Monuments" by the Department of Archaeology, Museums and Heritage, in a book called "Bidar Heritage", because almost 30 tombs are located in and around the city of Bidar. This city which is quickly urbanising, shares its border with the states of Telangana and Maharashtra. Bidar is packed with places of historical and architectural significance, because of which, it is a favourite shooting location for the Kannada film industry. Bidar has a rich heritage, with the dynasties of Maurya, Chalukya, Kadamba and more ruling the city. It is well-known for Bidri handicraft products and houses the second largest Indian Air Force training centre. 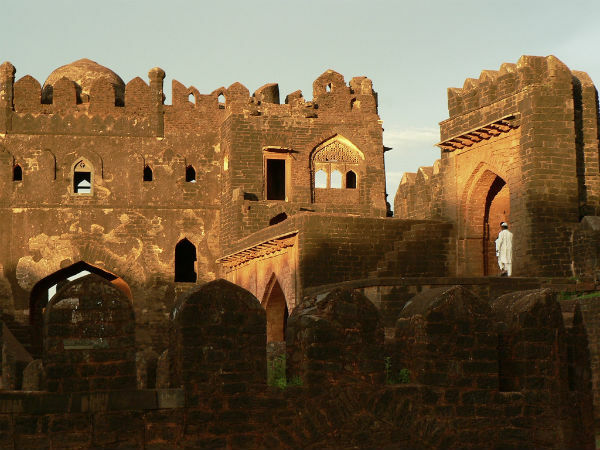 The Bidar Fort narrates the tale of the Bahmani Dynasty through its architecture. When Sultan Alla-Ud-Din Bahman Shah of this royal dynasty shifted the capital from Gulbarga to Bidar, the Bidar fort was built. It was constructed back in 1427 in the Persian style of architecture. The fort itself houses over 30 other monuments in its premise. Did you know that the popular song Ishq Sufiya from the Bollywood movie "The Dirty Picture", starring Vidya Balan and Emraan Hashmi, was shot in this very location?! Apparently, during the shoot of the video, a huge group of people crowded outside the fort! The staff of Archaeological Survey of India (ASI) along with the police had to intervene to control the crowd. Apart from that, scenes from various Kannada movies such as Bara and Sanju Weds Geeta were also shot right here. Some parts of the fort are in ruins or broken, however, it still stands tall as a magnificent structure. Bidar Fort formerly had a different outlook. The old fort was built by Ahmad Shah Wali Bahman, which was captured by Prince Ulugh Khan of Tughlaq Dynasty in the 14th century AD. Later, it was once again captured, this time by Sultan Alla-Ud-Din Bahman Shah under the Bahmani Dynasty, when Bidar was made the capital of the Empire. This was when the fort was rebuilt with an addition of awestriking mosques, gardens and palaces. In 1627, the Bidar Fort finally fell into the hands of the Mughal Emperor Aurangazeb. After the reign of Aurangazeb, a few other emperors ruled the Mughal Empire from Bidar. The fort was rebuilt using red laterite stone and has a unique rhombus-shaped layout. Three layers of moat surround the Bidar fort, which comprises of the breathtaking structures of an audience hall (Diwan-i-Am), grand fountain, perfumed baths, royal gates, to name a few. There are 7 gates in total with different names for each such as Mandu Darwaza (the main gate), Kalmadgi Darwaza, Gumbad Darwaza, etc. An impeccable palace that was called Rangeen Mahal which means "Colourful Palace", due to the ornate coloured tiles design, was later the royal residence of the Mughal Empire. The monument is also adorned with stucco art, wood carvings and calligraphic texts. The rooftop of Rangeen Mahal gives a bird's eye view of the entire Bidar Fort. Solah Khamba Masjid is a mosque that gets its name from the 16 pillars arranged in front of the mosque. It happens to be one of the biggest mosques of India. Gagan Mahal, Takht Mahal (Diwan-i-Khas), Tarkash Mahal and Jami Masjid are some of the other monuments found within the Bidar Fort. The Bidar Fort is open from 8 am to 6.30 pm on all days of the week. It is free for all the tourists; photographs and videos can also be taken for free. By Air: Rajiv Gandhi Airport in Hyderabad serves as the closest airport, located at a distance of 120 km from Bidar. This airport is well-connected to major cities such as Mumbai, Bangalore, Chennai, etc. Many airport taxis will be available that can be taken to Bidar. By Train: Bidar has its own railway station, which is connected to many cities such as Pune, Aurangabad, Hyderabad, and is located just 2.4 km from the Bidar Fort. By Road: A network of roads in good condition is available from all the cities of Karnataka. The neighbouring states easily connect to Bidar through NH 9. Government and private buses are also available to travel from neighbouring cities.